Logging and Sawmilling Journal’s new feature, View from the Top, is a series of interviews with the CEO’s of Canada’s major forest companies. We look at the opportunities that lie ahead for the industry, and the challenges as the industry pulls itself out of the worst downturn since the Great Depression. Don Kayne, the new President and CEO of Canfor Corporation, Canada’s second largest lumber producer, is an industry—and Canfor—veteran. Kayne started as a local sales rep for Canfor in 1979, selling coastal hemlock to accounts such as Lumberland and Beaver Lumber in Vancouver, before moving on to marketing Canfor’s staple product: SPF lumber. This was followed by a variety of sales and marketing roles, before being appointed Vice President, Canfor Wood Products Marketing and Sales in 2001. Logging and Sawmilling Journal caught up with Kayne recently to talk with him about his priorities for Canfor. 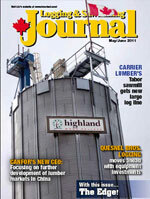 Logging and Sawmilling Journal: You have only recently taken over as President and CEO of Canfor. What are your priorities for the company on the sawmilling side? I’ll start with something that has been a critical piece and focus for Canfor for many, many years, and that’s been the safety side. We will definitely continue the world class safety focus we’ve had in the past. We will also be spending a lot of time looking at things on an operation-by-operation basis at Canfor, the capabilities of each of our operations, what they excel at, and finding the right balance between fibre and manufacturing capability, and product mix. We’ve got several sawmill operations that are doing really well and we have some mills that we need to take a hard look at in terms of what we can do a bit differently to make them more successful. I believe in the importance of diversification of lumber markets, so we will be trying to advance that even further. My view is that we’ve only scratched the surface on that, frankly, in a lot of the Asian markets, and there is a lot of upside potential still there to develop. One of the bigger issues is the medium term and long term fibre security in our operating areas, so we’re going to spend a lot of time understanding that. As with everyone else, we have heard conversations about AAC reductions when the beetle has run its course. We need to make sure that we’re represented well there, and that we have a good understanding of what we need in terms of fibre for each operation. Clearly, to invest at the levels that we have in the past, and that we have every expectation of investing in the future, we need to get the security for that fibre. Another thing that is really important, and it is becoming a bigger and bigger issue, is people, and the availability of people, particularly on the trades side. There is a lot of competition out there, from the oil and gas industry, and the mining industry, I think we need a very concrete HR plan from a people development standpoint internally, so we will also focus heavy on that, heavier than maybe we have in the past. LSJ: You mentioned the sawmill operations that are doing well. What do you need to do with the other sawmills to bring them up to snuff? DK: I think the main issue right now is really sawmill start-ups. We’ve already spent some capital at our Chetwynd sawmill operation, we’ve spent some on Mackenzie and some on Fort St. John recently. We’re trying to increase the speed of the mill start-up curve because start-ups can tend to drag on. We’re spending a lot of capital on planers and optimization, and a lot of it on the grading, with Comact’s GradExpert systems. Pretty much all of our operations in B.C. have autograding. LSJ: Canfor has a capital spending plan for 2011 totaling $145 million, and a three year strategic plan that calls for total investment in sawmill improvement projects of $300 million. A fair bit of that would be going for equipment? DK: That’s correct. We have $145 million in committed capital for sawmill improvements, of which about $65 million has been spent to date. The 2011 plans include the Polar upgrade at the planer and optimization, GradExpert. As well there is the Vavenby mill, that will be starting up in the fall, and that’s underway. We have an energy system going in at Chetwynd, as well as Plateau, plus optimization upgrades at the Graham sawmill in North Carolina. LSJ: Your background is on the marketing side of the business. 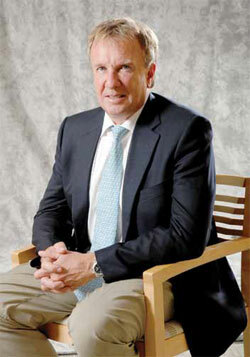 What additional efforts will the company be making to increase marketing and sales to emerging markets, such as China? DK: I think Asia in general is a huge opportunity for us for a couple of reasons. Number one is the whole green building initiative and environmental friendliness of wood products and the global desire for carbon reduction, period. I think as an industry we’ve done an OK job of promoting that and leveraging ourselves—but not a great job. And I see there is a lot of opportunity to focus on that as a foundation for our business in Asia. In China, we’ve done a really good job the last three years to increase our share of that market, starting with low grade and moving up the value chain to some degree, but mostly focused on industrial type products, the lower grades. We’ve done a good job on that, and former B.C. Forests Minister Pat Bell has done an exceptional job of supporting us on that. I think he has done a tremendous job, not only in supporting us in the China market, but in also bringing the industry together and focusing on market development, a focus that we’ve never had before. But the big opportunity in China going forward is wood frame construction—that’s the prize. We really need to focus in on that and that involves working with some of the developers in China. What they require is a solution to the software and design, the whole house package; so we can actually get in there and help them to design the homes, and how wood can be applied. We need to do a lot more to pull our products through there, but I do see that there is definitely the opportunity to double the volume the B.C. industry is doing with China today, which is about five to six billion board feet per year. Things are evolving in China, the customer base is much more solid than it used to be. We used to sell a lot to public/government companies. But now the customer base is a lot of private people. Our largest customer there is a steel producer who has recognized that if he is going to expand within the country, he needs to do something more associated with green building, so they have moved into wood products. We contract our Quesnel sawmill out to this up-until-now steel company. We’re starting to see some really solid examples of private companies getting into the business. Mitsui Homes is getting into China, Sumitomo is into the market there a little bit now. For Canfor going forward, it is not so much how much more volume we want to ship to China because we can ship all we want. It’s a matter of being much more targeted in terms of what we sell to over there, with market segments and customers. In terms of Japan, I also believe there is a huge upside there. Not only on the wood frame housing side, but the seniors housing, we’re doing more projects on that side of the business. And hybrid housing, too, where we are getting our 2 by 4 systems into the post and beam segment. The biggest problem in Japan is not so much the opportunity there as the supply—we’re limited on the J-grade supply because of the mountain pine beetle. India is starting to get a little more interested in wood. We have a new agent that we just signed up, and we’re starting to see more wood going into India for the first time, all higher grades, too. And we had a record year last year in Korea, all premium grades, higher than #2 and Better, square edge, even as high as J-grade. That’s turned into a really good business for us, as well. Overall on Asia, we’re very positive. LSJ: The efforts to diversify on the part of the industry seem to be quite different this time around, vs. previous efforts to diversify when the U.S. market went into the tank. When the U.S. markets improved, the industry took a step back from the other markets, but there really seems to be a commitment to developing these markets. DK: We’ve worked long and hard to get where we are in these new markets, as an industry and in conjunction with government and I don’t see any backing off on that whatsoever. We’ve got the highest level of relationships at the most senior level of the minister of housing and rural and urban development in China we’ve ever had. Minister Bell did a really good job there. I would say that there is no other country that has as good a relationship as we have at that level. Industry’s focus on diversification has been different this time around, but we have also had some pieces of good fortune. First of all we have a supportive provincial and federal government in terms of market development. We’ve also been fortunate that with Russia. Going back a few years, Russia has been off/on, off/on with their log exports and an export tax. China quite naturally got nervous about supply, and at the same time the Russians were showing increasing unreliability from a quality standpoint. So they started to get our product, and they like it and they trust us, and we’re reliable. I think that when the U.S. comes back, yes, there will be some product that moves from China into the U.S., for sure. But what it will allow us to do in all markets is to be much more focused on who we want to deal with, because I do believe there are going to be supply shortages. Just as in North America, we want to focus on the best customers who are committed for the long term, they are buying our products because they believe in what we are doing, and they believe in the future of wood products. But in terms of China, I see that market being sustainable in the future—there is such a huge wood shortage predicted there, 100 million cubic metres annually at some point. The market is close for us, and we can be competitive. LSJ: How is the company approaching the Japanese market right now, the rebuilding that will be required as result of the damage caused by the tsunami? DK: First of all, it was a terrible human tragedy. Our work right now is to assist where we can with immediate relief and reconstruction issues. The industry as a whole is focused on how we can help Japan to rebuild from the devastation. Going forward, we expect, as we did in China, that we will get support and direction from government, and start work on select reconstruction projects. Our Canada Wood Group presence in Tokyo will be the front line face of our support efforts on behalf of the forest sector. Part of that work will be within the scope of existing wood frame building types already well-established in Japan. But more importantly, we’ll also be looking at how we can utilize wood in earthquake reconstruction in applications, such as seniors housing or commercial building. Japan will always be an important market for us. The big issue in all markets, particularly overseas, is freight and transportation. What we’ve tried to do this time around, and I think we’ve done a good job as an industry, is to make sure we prioritize shipments for them. But going forward, we need to continue to demonstrate that we are trying to solve the transportation issues we are facing in B.C. An example is we recently put together a new agreement with Tolko, West Fraser and Western Forest Products on break bulk to show that we are looking at alternatives to ensure not only ensure supply, but that we can be competitive on a long term basis. Today, shipping lumber by containers may be OK, but we are going to need additional capacity in the future, and that will have to come to some extent from break bulk. That’s another example of a co-ordinated approach from industry—we’re basically all 25 per cent partners in this venture. LSJ: The U.S. has always been a big market for Canfor. What is your perspective on the U.S. market right now? How do you see housing starts recovering? What level do you see U.S. housing starts recovering to? DK: I see the U.S. market taking another one to two years. We’re still concerned about the high number of foreclosures and the high vacancy rates on rental units. On the flip side, we are seeing some improvement on the employment numbers in the U.S. for the last four or five months, which is encouraging, because that’s the first step we believe that has to take place. The process is we’ll see it first in the R and R markets, the Home Depots and Lowe’s, and we are starting to see that now in spite of the first quarter being tough because the weather was bad. We’re starting to see improving trends in both of the large home centre customers. In terms of new home construction, we think 2011 is going to be equally as tough as last year. Being very conservative on that front, maybe we’ll see 550,000 to 600,000 housing starts this year. Next year, maybe 750,000 housing starts. Where housing starts will get back to is typically a question I get—personally, I think we’ll be lucky if we get back to 1.2 to 1.3 million starts a year in the future. If we get up to 1.6 million, great. But 1.2 to 1.3 would have a huge impact on this market, globally, price-wise. If you think about where we are today price-wise vs. three years ago, we’re basically up $100 per thousand board feet. And this is in spite of having the worst economy in the U.S. since the Depression and a global recession. We’ve had the Middle East experiencing their Arab Spring unrest, and some of the construction markets there were huge for the Europeans and largely inactive today. We’ve got Japan being hit by a tsunami, and we’ve had bad weather in Canada and the U.S. But we are still $100 better today and we’ve got the same housing starts, or worse. If you consider the future outlook, China will continue to improve, the reconstruction will take place at some point in Japan, Europe has been hard hit and it will come back, the political situation in the Middle East will stabilize. When you think about the future, the upside is pretty darn good when demand starts to turn around. It’s very sensitive to supply. It does not look as optimistic from the supply side point of view. From the supply side, we know what the issue is with the mountain pine beetle in B.C., cutbacks in AAC’s in eastern Canada, and the Chinese are putting huge pressure on log exports in the U.S. northwest which is going to reduce production there. So we believe that not only the volume of fibre available, but the quality of that fibre going forward is going to be less. Those two factors combined should make for some pretty exciting times over the next five years for our business. LSJ: What do you think Canfor learned from this last industry downturn, which was so wrenching? DK: A couple of things. First of all, how important diversification is to the company. Back when the U.S. was very strong, we knew that things were not going to last forever. We focused very hard on overseas development, China was the biggest focus, and Japan, too. And that kind of tied into the timing of the Slocan/Canfor merger, with a lot more wood coming at us. That proved pretty valuable through this period. The other part that we learned is the value of a customer base that is committed, and that you have exclusivity. We were always very focused on higher end home centre business, so even in the worst part of the recession, we were still getting consistent takeaway, though at a reduced level. Another things is that all the very difficult decisions we made—around shutting mills, laying off people, reducing salaries—we did that fast and communicated all the way through. We also learned how to manage the business in a much shorter time frame. We used to do annual plans, then it was six month plans, then quarterly plans. We got all the way down to weekly plans, just managing the business weekly, for cash conservation. It would be hard to duplicate the kind of difficulties we went through in that period, I think it gives us a lot of confidence in managing this company going forward in what we think will be better times. It has also added a heck of a lot of discipline in terms of the people that are still here, and certainly discipline around costs. We do not want to get into that situation ever again and we need to be sharp. The trick going forward is that as soon as things turn around, that we remain focused hard on the cost side. When this thing turns around, we’ll be in much better shape that we were going into it. LSJ: Was there a particular point when you felt things had turned a corner, when it was starting to get better for the company, and the industry? DK: We had not seen anything like this before. We had been through the 1982 and 1992 recessions, but they were nothing compared to the last four years. At some points, it was being in survival mode, every day. The low point was January, 2009, for sure. It could not have got much worse. It was about a year after that that things started to turn. What we started to see is the China market emerging much quicker than we thought. And longer term, we were starting to feel that supply might be an issue with the number of companies which had taken permanent sawmill shutdowns. I’d say things started to get better sometime around mid-summer 2010, so not that long ago. Even today, as much as we believe we’re though the worst of it for the most part, we’re extremely, extremely cautious. In terms of going forward, we will want to see really sustained recovery in the U.S. before we make any decisions in too big a way. But we have a lot of faith and confidence in the U.S. economy. They will come back, and they will come back stronger. They have done it before, they are a very resilient nation and people. It’s not a matter of if, but when—we just have to be ready for it. LSJ: With so much of its operations in the B.C. Interior, how is the company dealing with the mountain pine beetle? How is it going to impact the company? DK: We believe we’re positioned very well in B.C. with where we are operating. Certain areas are tougher, like Quesnel. But we’re managing through that. We’re bringing in a bit more green wood than we have before, balsam and spruce. We’ve got some good tenures with a lot of green fibre, so we’re doing more mixed species. And we’re spending a good chunk of the capital at the sawmills around optimization, to try and improve the grade recovery because there are issues around keeping consistency when you are cutting more beetle wood. I was up in the B.C. Interior last week and we still have pockets of what we call fresh beetle, which is beetle wood that isn’t as old as some we deal with. So we are not seeing the negative impact as much, and it’s not so much the stain, but the shake, in the wood. We like to think with what we are spending on capital expenditures and the shifts in some of the areas where we are bringing in more green fibre—though we are paying more for that—has improved the mix and quality of the finished product we are putting out. We have Vavenby coming on and a lot of good green area there. We have our TFL in Prince George, which has a lot of good solid wood, as well as the north, Fort St. John and Chetwynd, Grande Prairie and Mackenzie, too. LSJ: Canfor almost seems to have been recast from being at times a sometimes paternalistic large corporation slow-to-change company to being a more nimble company. DK: There’s huge tradition and great history to the company, and we have great respect for the Prentice-Bentley families who founded Canfor. But I think it’s a different set of circumstances now. The business has evolved, and overall has become so much more competitive. You have to demonstrate that you are committed to competing on a global basis, not so much just in B.C. At the same time you have to understand that whatever you do from a value point of view, that any additional costs have to be more than offset, so your margins are better. You need to have a common vision, you need to have an absolute passion for this business, and act like owners and make sure every single decision you make is focused on achieving a better return for the company. That’s really what we have been focused on, and will be even more so going forward. To be able to be successful, we have to be sharp in every single producing region that we operate in. That takes a tight, focused approach, and we really try to have a tight executive. We only have six people in top management, who are really driven to take this company where it can be. The last four years has helped this, but you’ve got to be tough, you’ve got to be sharp every single day. But you also have to be very much aware of the customer, you need to satisfy them every day. We’re going to be extremely cost conscious going forward and focus on the customer in a big way. We have great, supportive ownership. I’ve been with this company for 33 years, and I’ve seen a lot over the years, but I haven’t seen a brighter future than what we are looking at right now. LSJ: How do you view the future for the Canadian forest industry? DK: I think it’s exciting, and we need to attract more people to our business, our industry. We’ve been referred to as a sunset industry but I think we’ve proven that wood products will be a great industry to be in again, going forward. We have some great advantages over some of the other building materials, the biggest one being the fact that wood is “green”. And that Canada is, without doubt, the best environmental manager of forests. And we need to be proud of that, and promote that. In terms of high schools, and universities and technical schools, I think we need to play an increasing role and help them get that message out. The other resource industries have had a pretty good ride here, oil and gas, mining. We’re probably the last resource that has not seen a sustained impact of the natural resource side, and we believe it’s our turn. Part of that is because of some of the new markets that are being created and the recognition that wood is the best solution to a green building structure. So we really think of ourselves as a green building solutions provider, and leverage on that and capitalize on that much more than we have in the past. As worldwide demand grows for renewable, responsibly harvested building materials, so does our need for energetic and talented people. Our industry needs to attract the talent and need to demonstrate that our industry is growing, expanding and profitable, and they are going to be rewarded. That is going to be critical any success you have—you need the people.